Reunion 12 supports International Localization. Note: Because the translations are created by Reunion users and not Leister Productions, we cannot verify the accuracy or quality of the work. The localization technology in Reunion 12 permits cosmetic adjustments to Reunion without actually altering the features and functions of the application. When a localization folder (or .lproj folder) for your language is placed inside your Reunion application, Reunion will try to use whatever resources it finds in this localization before using the resources in the default English localization, included in the released version of Reunion 12. Resources are items such as windows, menus, and text strings used in messages and reports. A localization only changes the Reunion interface (e.g., top menu bar, tool bar, button labels, etc.). The inner workings of the Reunion application are not affected. Why would someone want to use a Localization Folder? To create custom narrative event formats. To change defaults, such as the "&" string placed between couples. Why create a new localization rather than modify the English one that is already included? Localizations can be selected by changing the order of the languages in the OS X International Control Panel. Localization folders are very small because they only contain the resources that are different from the English version. It's easy to share .lproj folders. If one person translates Reunion for a particular language, others can benefit. Visit Apple's Developer Page, and read about Internationalization and Localization. Download and install Apple's xCode Tools. For app localization, you may prefer to use iLocalize. For manual localization, you might consider using OmegaT. Please note that the instructions on this page do not include the use of iLocalize or OmegaT. Download the Resource Minder application. Download and install the latest version of Reunion 12. Download the latest 'English.lproj' folder. 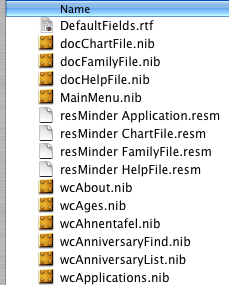 This folder contains editable versions of the .nib files found in the Reunion 12 application. Unzip the English.lproj folder, and rename it to your desired localization. From the Finder, control click on the Reunion 12 application and select "Show Package Contents." A new Finder window will open showing the Contents folder that is located inside the Reunion 12 application. Double-click this Contents folder, then double-click the Resources folder. Move the new .lproj folder into the Resources folder. Double-click the new folder to reveal the files to be localized. DefaultFields.rtf - Opens in TextEdit. This file is used to create the default fields when a new family file is created. Make sure that the TextEdit window is wide enough to prevent the lines from wrapping. Reunion User Views.pkg - Default user views. From the Finder, show the contents of this package and localize the default view names that appear to the right of the '#'. .strings files - Plain text files which can be edited using any text editor, for example Apple's TextEdit. .nib files - Open in Apple's xCode application or iLocalize. These files contain windows and menu bars. Note: .nib files that begin with 'doc' contain nothing to localize. .resm files - Open in Resource Minder. Only the text that appears in the 'Resource Data' window needs to be localized. After your .lproj folder has been localized, you should make that folder available to your users along with instructions on how to install the localization into the Reunion 12 application. Optional: If you would like to prevent others from opening and editing your localized .nib files, see the page for instructions on how to compile your .nib files.